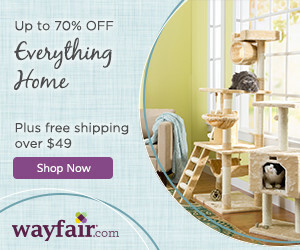 Scratching posts are one of the most important pieces of cat furniture, and every cat household should have at least one in every room. In addition to providing a natural outlet for your cat’s need to scratch, they can also prevent a variety of behavioral problems. Cats scratch for many reasons: to groom their claws, to mark territory with the scent glands located on their front paws, and to exercise the muscles in their front legs and all along the back. While some cat guardians have accepted that living with cats can mean scratched furniture, it doesn’t have to be this way. By providing plenty of attractive cat post options to cats, you can allow your cat to exercise her natural instincts without sacrificing your living space. Some cats prefer to scratch vertically, others horizontally, and some like to alternate between the two methods. Until you know your cat’s preference, it’s important to offer both vertical and horizontal scratchers. Regardless of orientation, make sure scratchers are large enough so your cat can fully extend her front legs while she scratches. Cats tend to forego using scratchers that are too small. 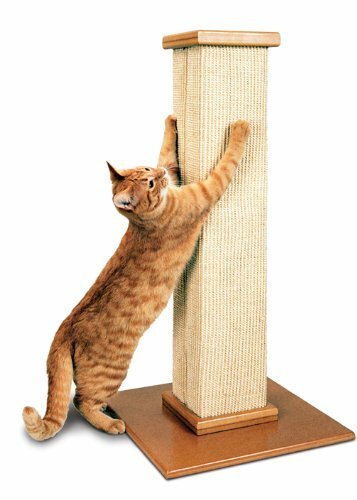 Cat posts come in a variety of materials, ranging from corrugated cardboard to carpeted posts to sisal to wood. Most cats seem to prefer sisal to any other surface. Provide several different options until you know what your cat prefers. A word of caution about carpeted scratchers: if your cat is a horizontal scratcher, offering a carpeted scratcher may lead to her also scratching your carpet. Your cat will not understand why it’s okay to scratch the carpet on her post, but not the carpet on your floor. Place scratching posts in areas where your cat likes to spend time. If you’re trying to discourage your cat from scratching a particular piece of furniture, place a scratching post right next to it. Once your cat starts using the post, you can gradually move it further away. Sprinkle cat nip on a new cat post to attract your cat to it, or put treats on or near it. Praise your cat when she uses the post. You can find our favorite scratching posts and scratchers in our Product Guide. This article was first published on Answers.com and is republished with permission. I have 2 new kittens. I am wondering if horizontal scratchers are better, because they don’t encourage vertical scratching of the sofa, etc? Every cat has different preferences – I’d offer both, and you’ll soon learn what your kittens like. And no, vertical scratchers do not encourage scratching the sofa. I have 2 of the one pictured, my 3 cats love it. I bought one from a person locally who said her cat wouldn’t touch it though. Ah, but some cats prefer a horizontal scratching surface. One of my cats only uses a horizontal surface, and loves his Scratch Lounge. When he’s happy, the first thing he does is run to have a super enthusiastic scratching session on it. And sometimes he sleeps in it. I’ve had one of these very nice vertical poles available to my cats for a few years — he’s never used it. You’re absolutely right, Cheri – some cats prefer horizontal surfaces. My girls like both, but the vertical ones get more use. This is interesting. it also answers the question why one of my cats never touched the pole again when we replaced the rope on her after it got worse out.